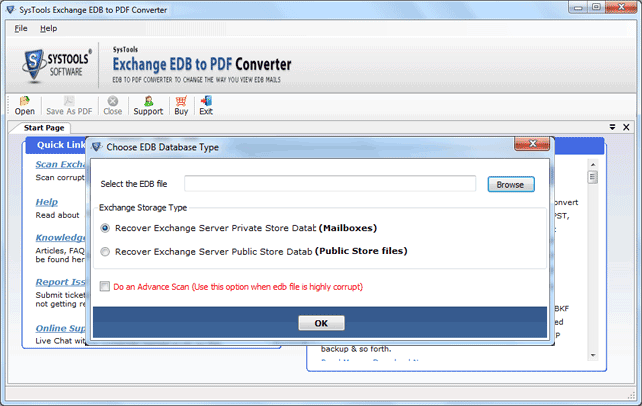 Exchange EDB to PDF Converter is a smooth solution to convert EDB messages into PDF file format. The software loads all the mailboxes of an EDB file and save them in .pdf. All this functionality is carried away in an effortless manner without any change in the existing data. This software edition is capable of loading, scanning, and previewing the EDB mailbox data on preview pane. The software exhibits a quick scanning on EDB file through which it extracts all mailboxes from Exchange database file. However, if the EDB is corrupted / damaged then, users are provided with useful option of advance scanning. The tool will repair file, extract data from it, and instantly loads that upon preview pane. 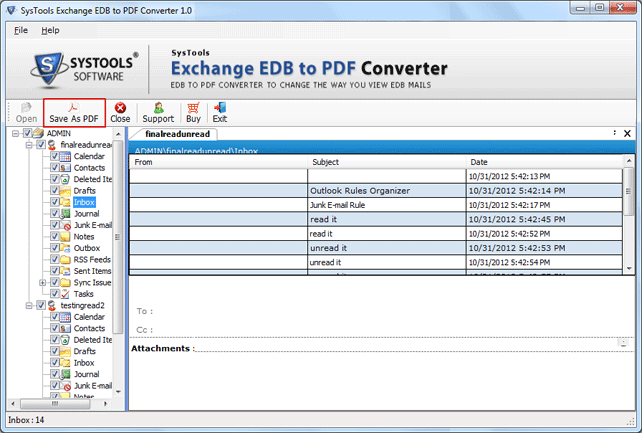 EDB to PDF Converter provides a useful option to export selective emails from the browsed file. It is not important that users have to save all the loaded emails in PDF format. Instead, they can check the checkboxes of only the desired messages and then right click on them for selective migration. How many EDB files are supported by your software while browsing? The software gives support to one Exchange database file at a time. It extracts multiple mailboxes from this single EDB file and simultaneously exports them in PDF format. Will your tool convert EDB emails with attachments in PDF file? Yes, the software is designed with capability of printing messages of EDB file in PDF format. It will keep the extension of attachment same as they were before conversion. Does the converter requires Microsoft Exchange environment for working? No, only the EDB file in offline or dismounted mode should be there while converting EDB emails to PDF. Will this EDB to PDF converter hold the original folder structure of browsed file? Yes, our product is capable of retaining the same folder structure as it was at the initial point. Not only this but, the content of message will also be same at the time of conversion. 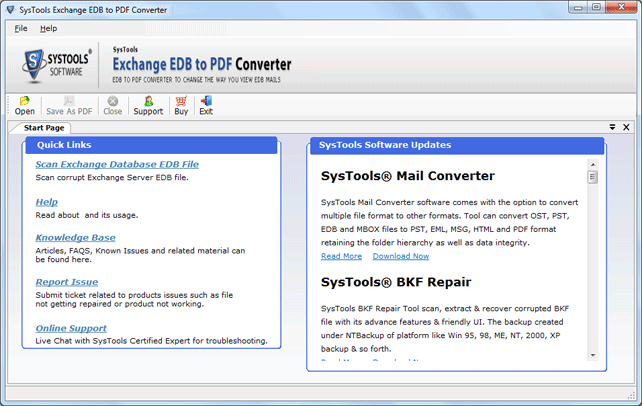 "Exchange EDB to PDF converter is the best software to print Exchange messages to PDF with attachment. In a brilliant way, the tool exports all the technical properties of an email from EDB to PDF file. No challenges are faced while exhibiting the migration with help of this software. I am greatly impressed with working of this utility and appreciate the hard efforts of the developers"
"This is the only file migrator available in digital market to convert Exchange messages in PDF format. 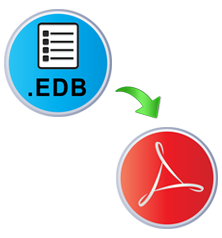 EDB to PDF file converter is the designed with all functionality that are required to accomplish the process. It is not wrong to say that the software developer have really covered the latest need of end users and that too by rendering effective solution towards it"